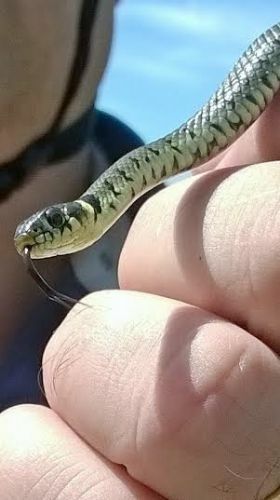 First grass snake I've seen out and about in my home town of Gillingham Dorset. A small (last year hatched?) juvenile was crossing the path that runs next to the river Stour early afternoon 21st June with warm sunny conditions about 21c. The area has what looks like ideal habitat and I've heard many stories of people finding them in their gardens while a neighbour of mine also had a small one turn up on his driveway on our estate a few years ago. So really I haven't done well at finding them on my home patch to date but they must be fairly common but as always hard to spot. Has anyone else snake encounters to share in North Dorset?